When it comes to working under harsh conditions, mobile machines in the construction, agriculture, mining, and material handling industries — as well as in the military — are at the top of the list. Measuring instrumentation needed to ensure safe and efficient performance must be robust and capable of withstanding extreme operating conditions. The simple and proven magnetostrictive principle used in magnetostrictive float level sensors provides a good solution for obtaining accurate and reliable continuous measurement of fluid levels in hydraulic tanks and reservoirs in mobile machines. vibration from hydraulics, engines, transmission, gear drives, etc. 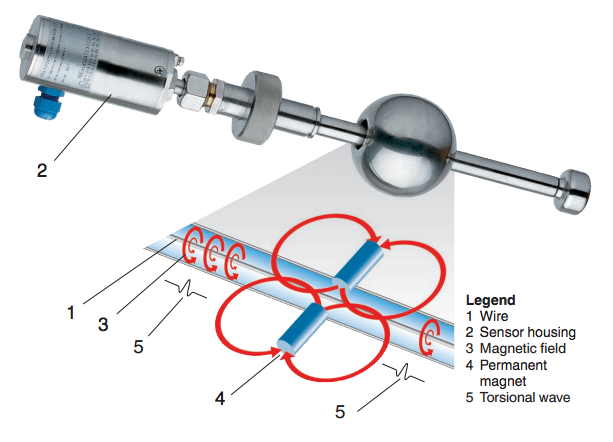 In magnetostrictive float level measuring instrumentation, a current through a wire produces a circular magnetic field. The wire, made of a magnetostrictive material, is fixed inside a guided tube. A float with permanent magnets sits on top of the fluid to be measured, and it acts as a position transducer. The interaction between the magnetic field of the magnetostrictive wire and the magnetic field created by the float’s permanent magnets generates a mechanical torsion in the wire. At the end of the wire, a sensor with a piezo-ceramic converter translates this mechanical torsion into an electrical signal. Level measurements made using magnetostrictive float technology are not impacted by foaming, bubbles, boiling, vapors, condensation, pressure, temperature changes, or density changes of the media. Magnetostrictive float sensors are highly accurate and allow continuous level measuring. WIKA manufactures a complete line of magnetostrictive sensors well suited for use in mobile machine tanks and reservoirs. The FLM series, for example, is designed for harsh operating conditions, and it features the process connection as well as the guided tube and the float made of stainless steel or plastic. FLM level sensors are easy to install and to commission. They require a one-time calibration, with no recalibration necessary. The sensitivity to changes in fluid level can be adjusted for each application, and the level can be displayed proportional to volume or to height. FLM sensors are extremely accurate and work well for a wide range of fluid temperatures. A large selection of electrical connections, process connections, stem lengths, and float dimensions ensure there is one configuration that fits your particular application. Magnetostrictive level sensors provide accurate and reliable continuous level measurement, independently of physical and chemical changes in the media. Call WIKA’s experts today. They can help you find the optimum solution for measuring level in your mobile machine application.